Oscoda junior Brayden Mallak and senior Colin Lueck hug after their regional final loss. Houghton Lake, Mich. — The undefeated ninth ranked division three Oscoda Owls entered the regional final against their toughest opponent yet, seventh ranked Sanford Meridian. The Mavericks averaged 61 points per game, and it was going to be up to the Owl’s defense to stop the tall Meridian team. The Owls started off hot, pulling out to a 7-1 lead, but then the Mavericks answered with three 3-pointers by three different players, Lucas Lueder, Hunter Merillat and Brett Barriger. Meridian took the 15-12 first quarter lead. 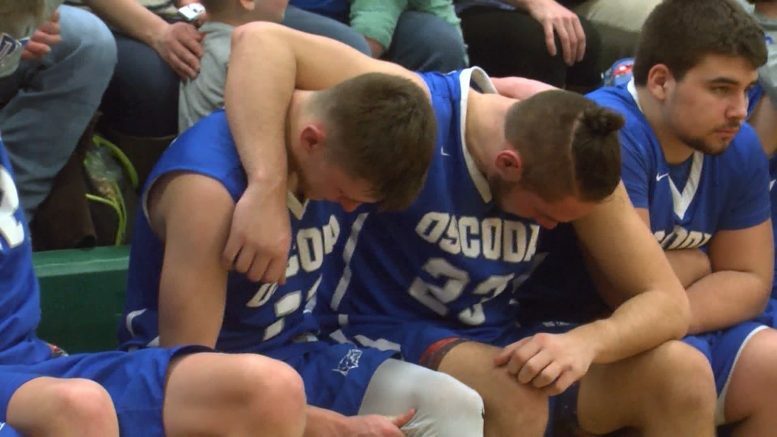 Oscoda struggled in the second quarter, only scoring four points versus Meridian’s 16, including two 3-pointers each by Lueder and Trey Plichta. Owls Head Coach Seth Alda must have given the blue and white a good halftime pep talk because their confidence to throw up shots increased significantly. The Owls scored 19 points in the third behind sophomore Owen Franklin and senior Jacob Post, but Oscoda could not catch a break because the Mustangs dropped four more from behind the arc. Gabe Kellstrom stayed strong through the fourth quarter, knocking down two 3-pointers and another bucket. Again Meridian never wavered making four more 3-pointers, totaling 14. Barriger and Plichta led the Mustangs with five 3-pointers each. The Owls defense protected the paint, but the Mustangs were too good from deep. Sanford Meridian topped Oscoda 65-44, advancing to the state quarterfinals. The Owls ended their perfect winning streak with a (24-1) season record.